Walking into The Dixon Studio for a sold out matinee performance and seeing that at least half of the audience were young children, my first thought was ‘Oh Lord, all I’m going to hear is sweet wrappers rustling, a lot of fidgeting and requests to go to the toilet’! I shouldn’t have been surprised that there were so many children there; after all, Roald Dahl is quite possibly one of the most popular children’s authors and storytellers of the 20th century, having sold millions of books worldwide. I can’t imagine that there could be one child today who hasn’t either read one of his books, seen a film or watched a play or show which has originated from Roald Dahl’s works. Such is the quality of his writing and in turn, Nineteen12’s production, that in fact this young matinee audience were most impeccably behaved and glued to their seats throughout. The Witches tells the story of a boy and his grandmother and their plan to rid England of all it’s witches. Grandmother is played by softly spoken Rebecca Perry-Gamble and her grandson, only known as Boy in the play, is portrayed with great credibility by Harry Neal. Such is Harry’s commitment to the part, he even agreed to have his legs waxed before the run so as to make it seem more believable that he was a 10 year old boy. Harry managed to capture perfectly the mannerisms of a 10 year old boy not only in his physicality but also emotionally. He also proved to be a talented puppeteer. Sam Thomas as Bruno Jenkins, the rather rotund lad obsessed with food, had the young audience captivated from his first scene entry with his huge jaffa cake consumption, much to the envy of two small boys sat in front of me! (Oh, alright, and me - I do love a jaffa cake!) His comedy timing was perfect and he had all the audience, not just the children, in stitches with his antics. Another good comedy pairing were Leah-May Keeble and Ben Smerden as Bruno’s uncaring parents. I particularly enjoyed the scene between Bruno and his dad, where Bruno was clearly heading to be a chip off the block. 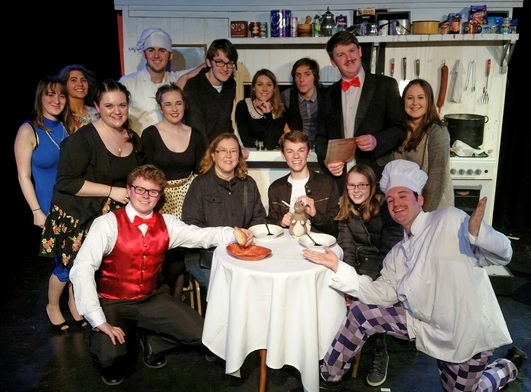 Some of the cast had more than one part and this worked very well, although there did seem to be a slight confusion with some audience members where Sam (Bruno) also played the part of a waiter. I overheard one child whisper to his mum, “That’s Bruno..” The boys playing witches really made me laugh and Eliot Bigden, Josh Picton and Jonny Buxton were all hilarious. The use of puppets within the play worked to great effect and I could sense that the children in the audience were really enamoured with them. Comedy played a large part in this show and there were lots of laughs from the scenes with the Witches and also from Jonny Buxton and Tom McCarthy as Head Chef and Second Chef in the kitchen scene. Jonny Buxton certainly pulled out all the stops to give a great comedy performance in all the parts he played and even managed to fob off a heckler in the front row, who was quite vociferous in his approval of the comedy banter. Lighting was cleverly designed and the use of scenery was original and imaginative, in particular one flat being used as a tv screen and then a front door and then when turned around, was a kitchen, complete with sink and cooker and the gap where the tv screen was became a serving hatch - brilliantly inventive. I also liked the scene on the hotel balcony where Grandmother drops The Boy Mouse down; again great use of imagination here. The person who gets my highest praise though and who has to be the hardest working member of this company, has to be Claire Brooks, for not only did she do a magnificent job in directing this play, she also designed the set, made the puppets and props and even made the costumes. I daresay, she was probably Stage Managing too and chief cook and bottle washer! So, in conclusion, if I had to mark this play judged on the behaviour of the audience, I would certainly give it 10 out of 10 and send it straight to the top of the class. An excellent effort all round. So now you can all put your chairs up, tuck into your sweets, have a little run around and pop off to the toilet…oh…. and that goes for the kids too!